Two days after Pentax's entry into the video DSLR game was leaked all to hell, the company has issued a formal announcement. So that 720p video function, automatic HDR, and lush LCD? It's all there. Built around an all-new, video-capable 14.6-megapixel sensor, the K-7's weather-sealed, magnesium alloy K-mount body helps set it apart, at least somehow, from the burgeoning field of low-to-mid-range video DSLRs from larger manufacturers like Canon and Nikon. Other salient features include an interestingly diverse array of video resolution options (720p, 1536x1024, and VGA), all recorded at 30fps, the automatic HDR mode, HDMI output, a 921,000 dot, 3-inch LCD with Live View function and in-body shake reduction. Moving on the core camera specs, the K-7 looks solid. It'll shoot 5.4 stills per second, boasts a maximum shutter speed of 1/8000th of a second and supports an admirably high ISO 6400. Dust removal, images processing, AF and metering are all said to be improved over existing Pentax models as well. Of course, impressive numbers and snazzy new feature claims don't mean a thing unless they've been demonstrated to translate into clean, noise-free images, but they're all we've got for now. Then there's the matter of price. A body-only price of $1300 positions the K-7 a broad step above the sub-grand Canon T1i and Nikon D5000, but well below the high-end Canon 5D Mk II. That said, it's the first camera to address the durability concerns raised by using a DSLR as a camcorder, and it fares well against its cheaper competition on paper. For now, that is—who knows what other manufacturers will have dreamt up by the time the K-7 ships in July. Full release below. 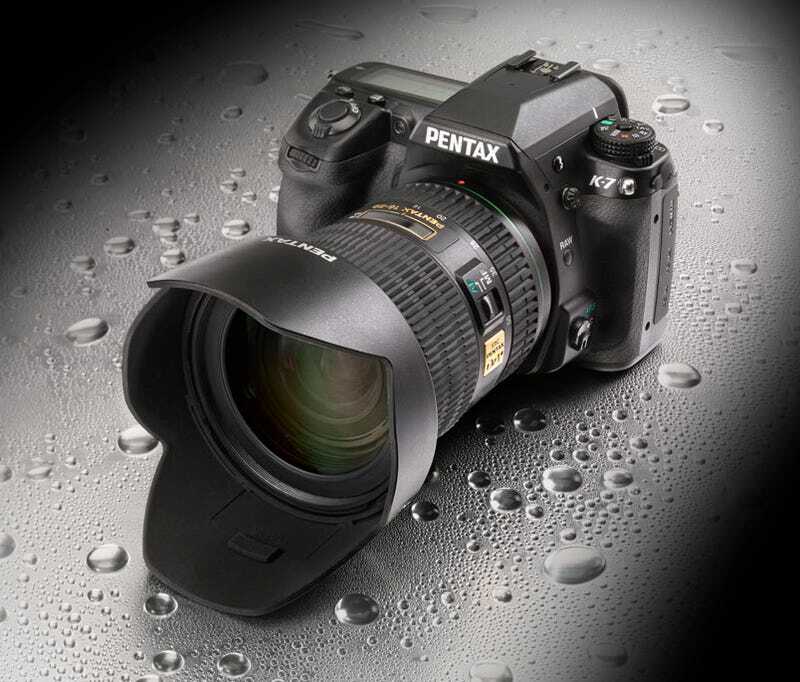 "The K-7 will appeal to many current PENTAX SLR photographers who have been asking for more advanced features, but in a smaller, solid, comfortable-to-hold body," said Ned Bunnell, president, PENTAX Imaging Company. "We also believe the combination of the K-7's smaller, high quality construction coupled with the growing line-up of our Limited compact prime lenses will appeal to serious shooters who currently don't own or previously hadn't considered adding a PENTAX to their camera bag." An HDMI port with selectable output resolution (1080i, 720p, 480p, and auto) offers high resolution playback of images and video on modern high definition TV's. The K-7's Dust Reduction system, improved over previous K series cameras, features a piezo-ceramic vibration action to the sensor's low-pass filter for dust-fee image capture. Along with the body, PENTAX announced a D-BG4 battery grip for exclusive use with the PENTAX K-7. This battery grip may be used in combination with the camera's rechargeable lithium-ion battery to double camera's battery life. The D-BG4 also accepts 6 AA batteries in a alternate battery tray for added freedom when shooting in the field. With a vertical shutter-release button, e-dials, AE-lock and a new focus button, the grip features the same weather-resistance, dustproof and coldproof construction as the PENTAX K-7.